The lead theme chosen for this year’s Hannover Messe is “Integrated Industry – Creating Value”, which reflects a new turning point for Industrie 4.0, as mature technologies have begun to generate a broad spectrum of concrete applications. Digitalization is having an impact, reshaping economies, and asserting its place on global agendas. Meet the suppliers 4.0 that are revolutionizing products, services, and business models from the inside out. The rising tide of connected devices that characterizes the IIoT exacerbates the need for new endpoint security solutions embedded by design and offered to customers by default. 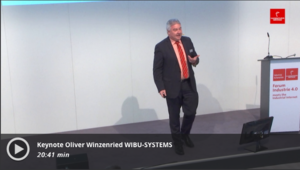 Follow Wibu-Systems as it moves around the exhibition and raises awareness for the opportunity to achieve higher business and technology performance through higher encryption, higher security sophistication, and higher GTM versatility. On April 24th, at 1 pm, in room Frankfurt, we will be holding a press conference that will reveal more details about a global hacking contest. The goal is to prove the strength and correctness of Blurry Box, a new encryption method we developed with the Karlsruhe Institute of Technology. With the rise of software as the primary resource for the evolution of technology, the risk of cyberattacks against its availability, confidentiality, and integrity is reaching new heights. Blurry Box offers a more advanced solution to all software developers and is ready to be put to the test in industrial applications as well. On April 26th, 1 to 2 pm, at the “Industrie 4.0 meets the Industrial Internet” forum in hall 8, Oliver Winzenried, our CEO and founder, will talk about “Secure Digital Identities as Anchors of Trust in Industrie 4.0”. The podium discussion will focus on the reasons that make this specific security mechanism vital for the Industrie 4.0. Together with representatives from Bosch, Homag, and PROSTEP, he will illustrate the different types of digital identity that are available, and explain the practical application of the concept. On April 27th, 11.30 am to 12.00 pm, Oliver will again be on stage in the “Industrie 4.0 meets the Industrial Internet” space in hall 8 for a solo lecture on “Digitization Opportunities with the Use of Licensing, Security, and OPC UA in Embedded Systems”. OPC UA is a multi-platform, plug & play Information Exchange Standard for industrial smart automation and cloud networking. Its integration with CodeMeter provides the ultimate technology in access control, authentication, encryption, and license management to fulfill the needs of the digital economy. CodeMeter Embedded 2.0, a modular, scalable, compact-sized, and customizable runtime environment that supports a plethora of operating systems and platforms, like Intel x86, PPC, ARM, Windows, Linux, Android, VxWorks, and QNX, interacts with hardware and software-based secure repositories for encryption keys, trust lists, and configuration data, interfaces with HID, File I/O, SPI communication systems, and even with Trusted Platform Modules of third parties, is deeply integrated in an ANSI-C OPC UA SDK, and is fully compatible with the other CodeMeter flavors running on computers, mobile devices, and even microcontrollers. CmStick/CM, the world’s smallest CodeMeter stick with high-speed 8GB flash storage, USB 3.1 interface, and a sleek, chic, and robust ultra-compact, full-metal USB body. Equipped with an Infineon SLM97 smart card chip with full CodeMeter functionality, it supports the new Universal Firm Codes and includes an optional encrypted CmSecureDisk flash storage partition. The hyperstone U9 flash controller and its patented hyMap® firmware meets the toughest industrial requirements in terms of life expectancy, reliability, and the prevention of data loss caused by power outages during writing. The high-tech construction as SIP (System in Package) module in the connector body was designed with extreme environmental conditions, including vibration, humidity, and temperature fluctuations in mind. IUNO, the German Nation Reference Project for IT Security in Industrie 4.0, has made great strides since last year. Working with a group of specialized IT vendors and academics, we are putting down solid foundations for a major overhaul of industrial practices. In hall 2, booth B22, we will be presenting ways to guarantee cross-domain trust for the manufacturers of networked products. Our goal is to design an ideal secure machine that can integrate seamlessly in the security framework of the customer, be it a small one-man shop or a global player. To illustrate the concept of the license-based economy, a separate project uses CodeMeter License Central to link licenses with beverages: Drinks are served and billed based on the customer’s order. In a third project, we explore endpoint security by design: CodeMeter Runtime is used for the remote maintenance of clients, and CodeMeter Embedded for the remote maintenance of machines. Together with dozens of Industrial Internet Consortium (IIC) members, we will be participating in a security testbed demonstration that will span across the IIC Member Pavilion (Hall 8, booth C24), the Plattform Industrie 4.0 exhibition space, other IIC member’s booths, and even remote locations. The overall goal is to demonstrate “security without borders” in a very heterogeneous landscape. For its part, Wibu-Systems will join the expanded infrastructure with an embroidery machine whose production status data are going to be encrypted with CodeMeter, transmitted over a secure communication channel, and authenticated via digital certificates. Ultimately, this element of the testbed will show how to implement know-how protection and secure key storage in smart manufacturing.